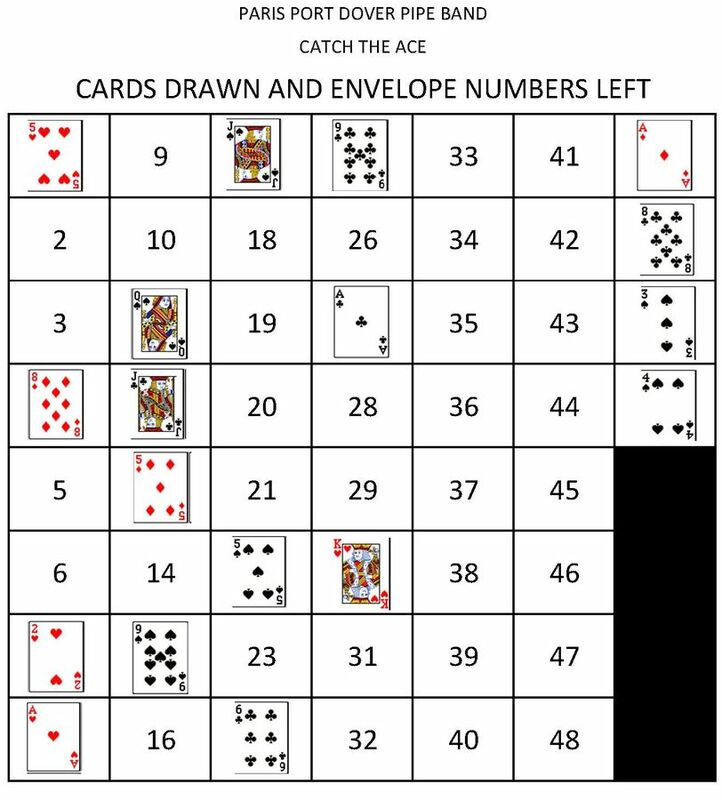 Catch the Ace - WEEK 13!!! Congratulations Jim Koshowski!!!! Jim walked away with the $125.00 weekly prize last night at Dragon Sport Bar. Jim’s envelope choices of 21 and 44 revealed the 4 of Clubs and the Queen of Diamonds….THE ACE OF SPADES IS STILL ON THE LOOSE!!!! 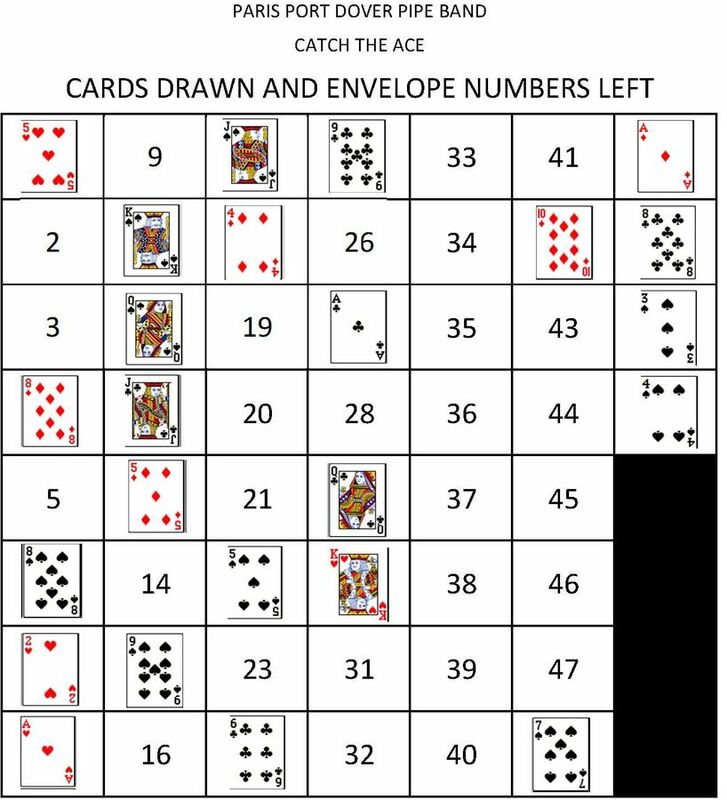 Despite all the premonitions that this would be the week that the Ace was caught….IT WAS NOT!!!! 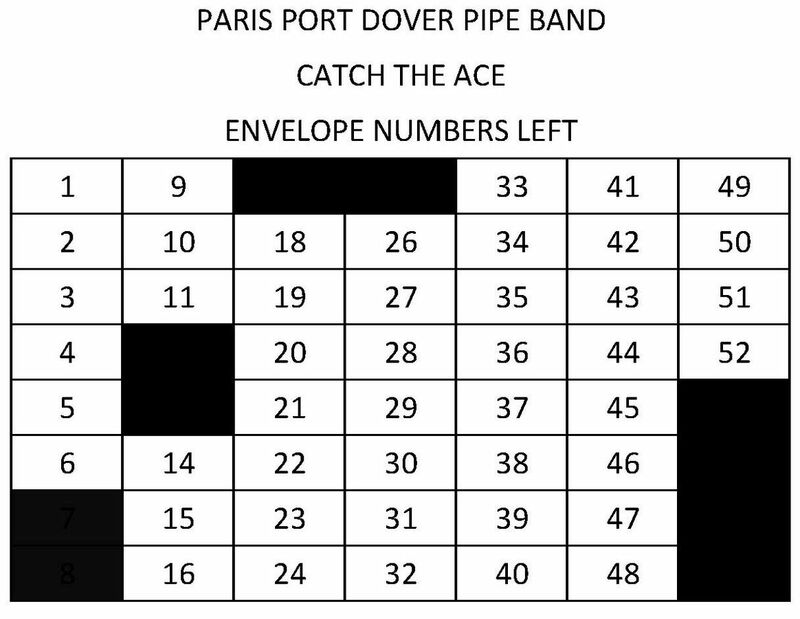 The Ace of Spades continues to elude our weekly winners…. The weekly winner was Paul Lofthouse…biggest weekly prize so far! 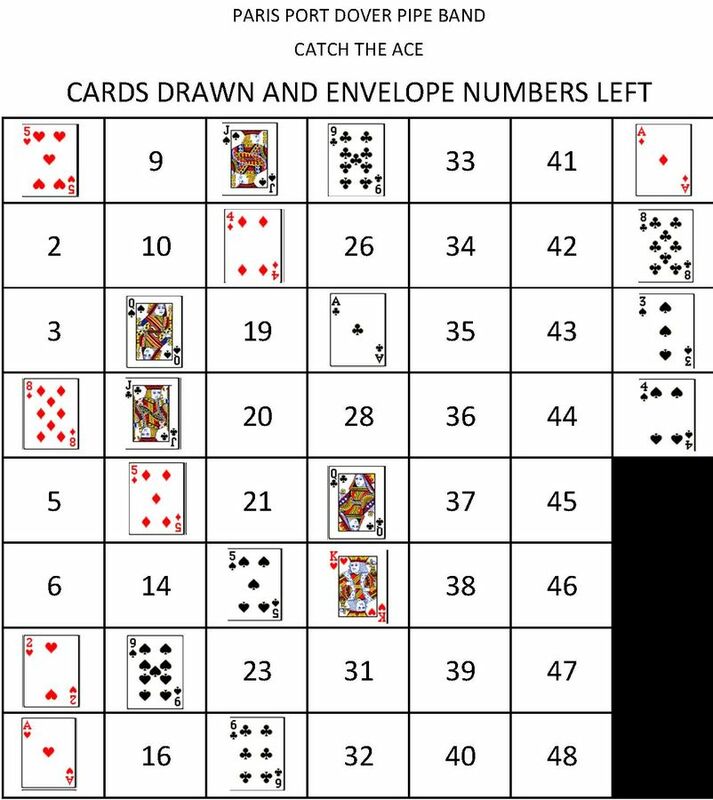 Paul’s envelop choices of 6 and 42 revealed the 8 of Spades and the 10 of Diamonds. Congratulations Tanya Petcoff!!!! This week’s weekly prize was 103.00! The Ace of Spades continues to elude us, though! 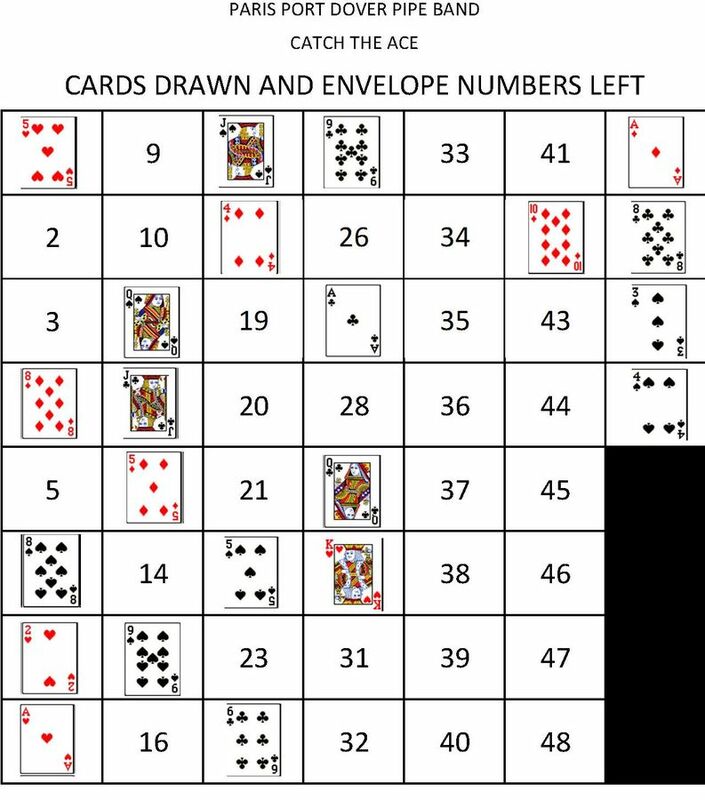 Tanya’s envelope pics of 18 and 29 were opened to reveal the 4 of Diamonds and the Queen of Clubs. The jackpot is 1 404.00!!!! We anticipate that this will be over 1 500.00 for the next draw!!!!! Congratulations Al Dutkewich!!!!! Last Thursday’s prize of 87.00 is yours! Al caught 2 Aces….but not the Ace of Spades! 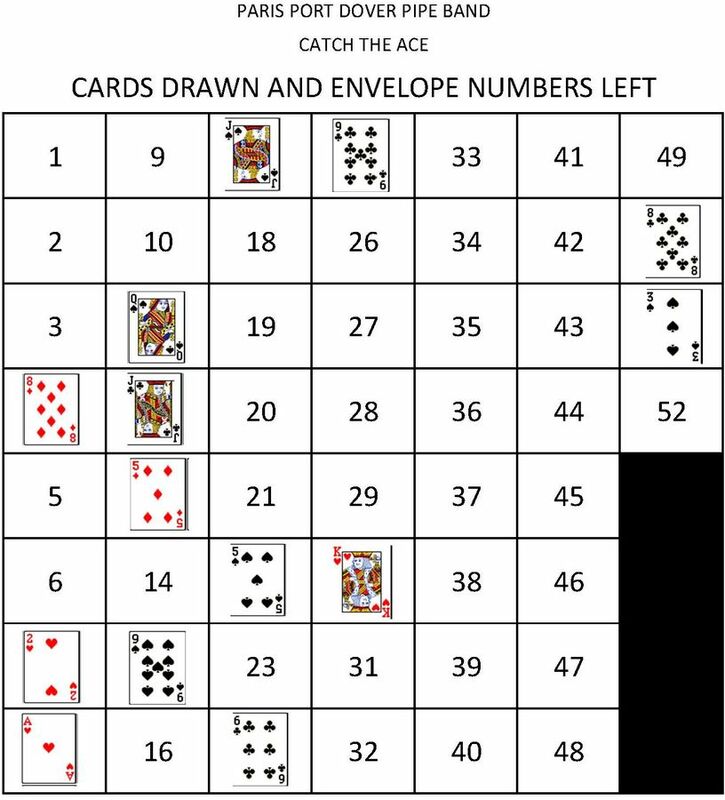 Al’s envelope choices of 27 and 49 revealed the Ace of Cubs and the Ace of Diamonds. The jackpot is now at 1,249.50!!!! 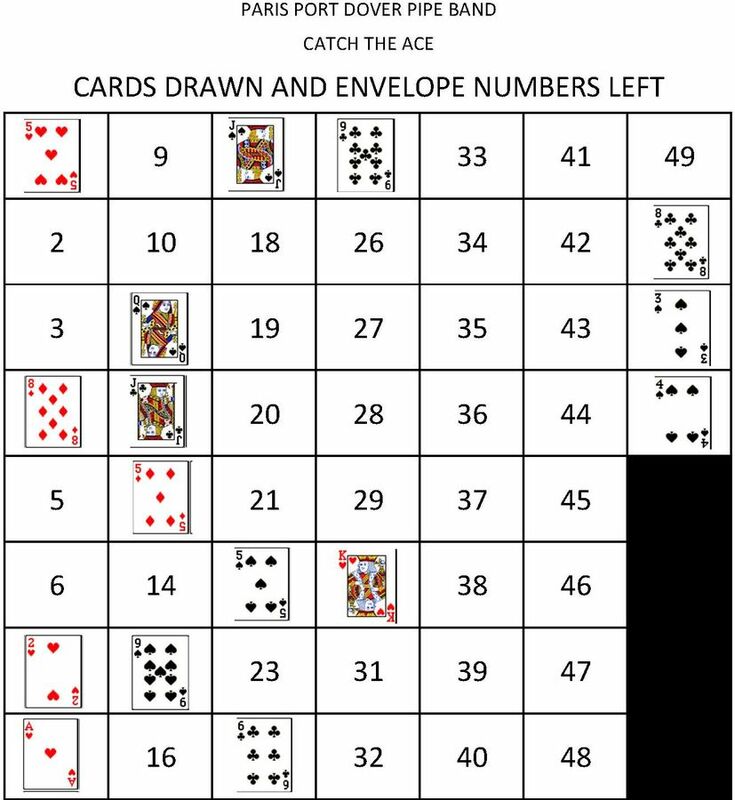 Catch the Ace - Week 6! Congratulations Jim Mittendorf!!!! You are this weeks winner of this week’s $101.00 prize! 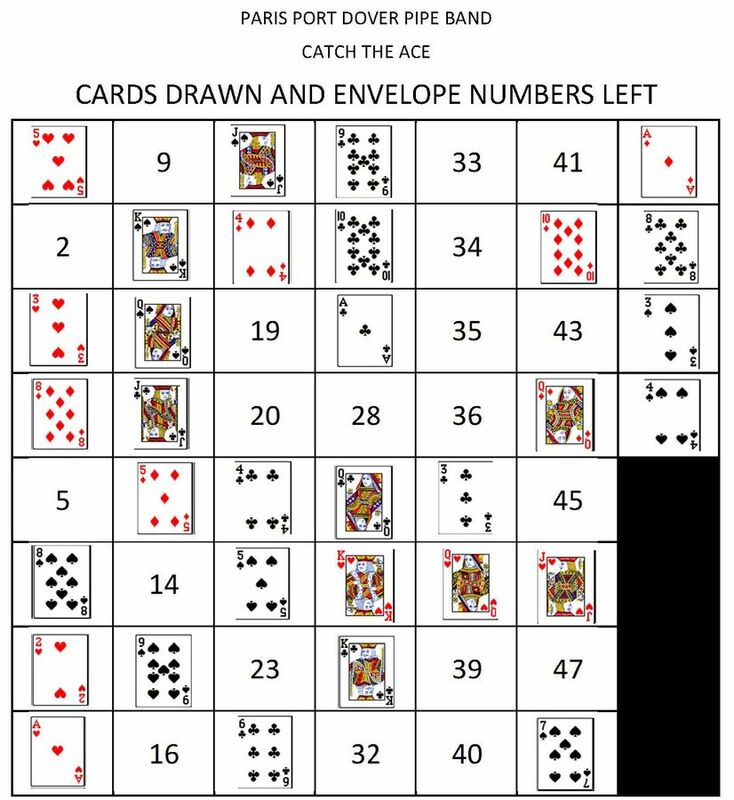 Jims’s envelope choices were 50 and 51, containing the 8 of clubs and 3 of spades respectively…..the Ace of Spades is still in play!!!! 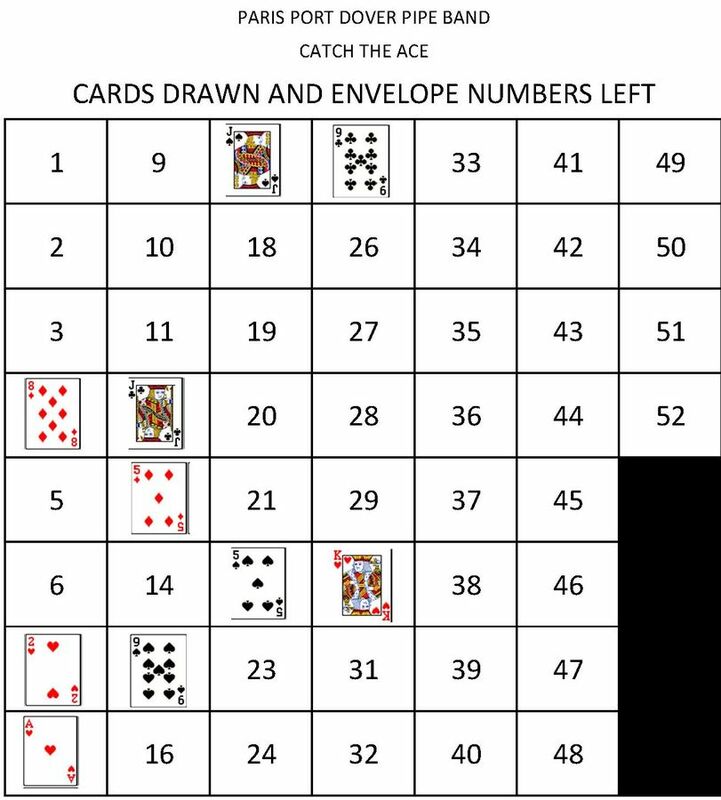 The jackpot is now at $864.00 with only 40 envelopes left…. 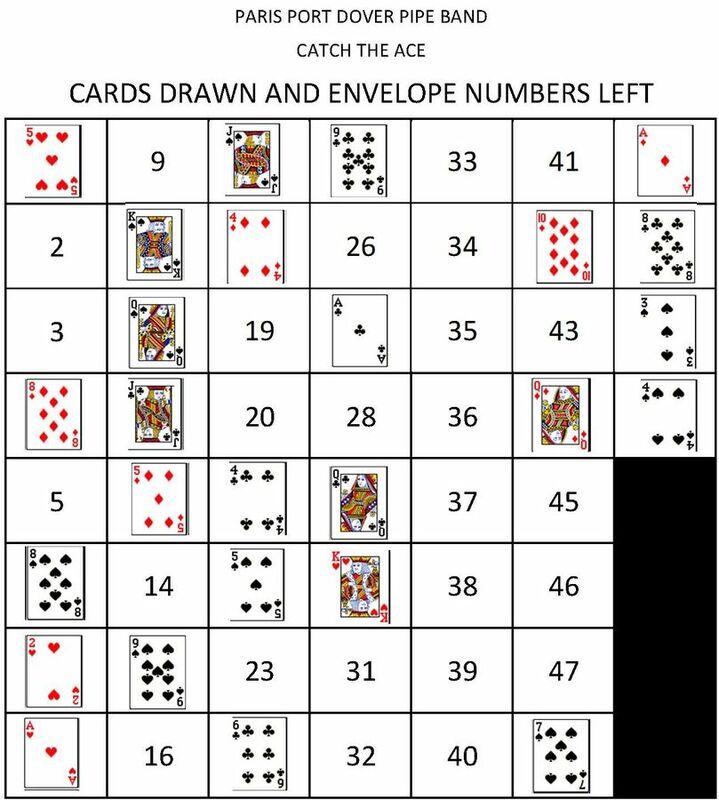 Catch the Ace - Week 5! Winner of this week’s $69.00 prize is Laura Adams. 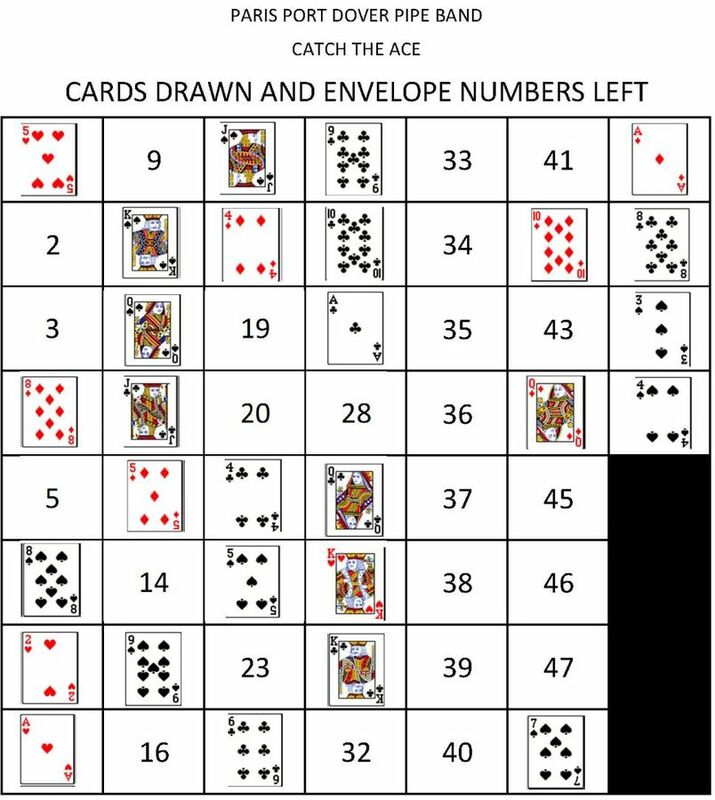 Laura’s envelope choices were 15 and 30, containing the 9 of spades and King of hearts respectively…..the jackpot grows!!!! The jackpot is now at $712.50!!! Winner of this week’s $86.00 prize was Nancy McLea. 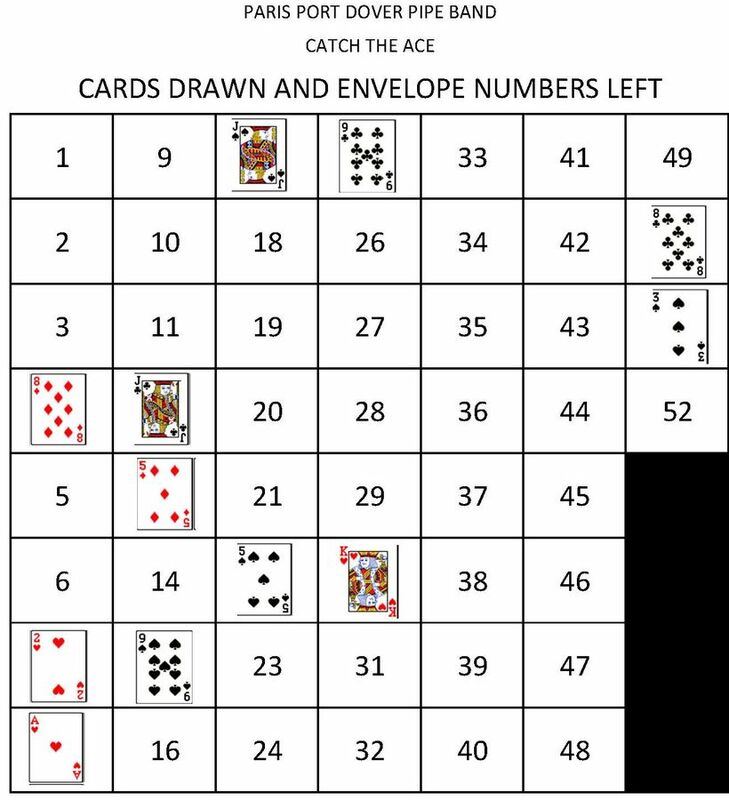 Nancy’s envelope choices were 4 and 22, containing the 8 of diamonds and 5 of spades respectively…..the jackpot grows!!!! The jackpot is now at $609.00!!! Winner of this week’s $81.00 prize was Greg Roy. 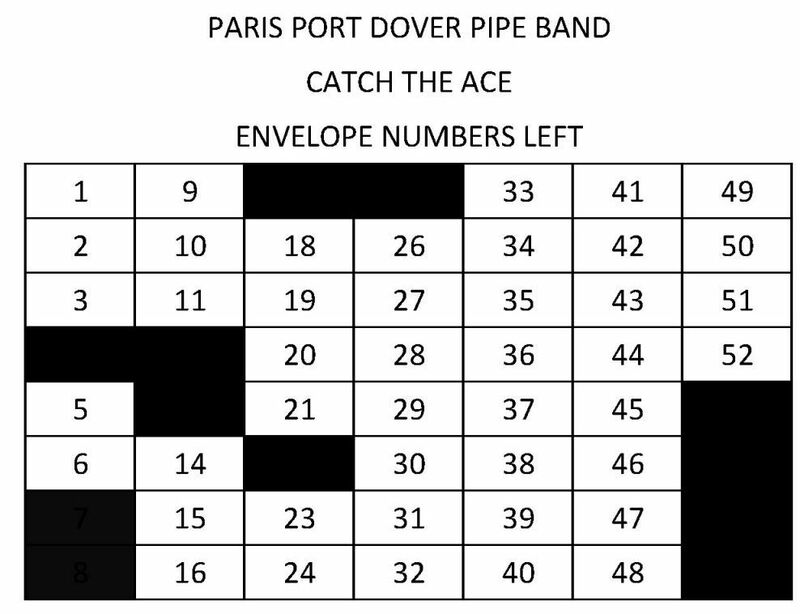 Greg’s envelope choices were 13 and 25, containing the 5 of diamonds and 9 of clubs respectively…..the jackpot grows!!!! The jackpot is now at $480.00!!! There’s no better way to celebrate tomorrow than playing your bagpipe for family and friends. (And good performance practice too). Practice on Thursday. Toronto Indoor coming up in only 2 months! For all signed up for the Fred Morrison workshop Saturday afternoon at 1pm, please bring practice chanters and small pipes and whistles if you have them. For the Sunday workshops at 9am and 1pm, bring practice chanters and pipes! HOT OFF THE PRESS: FRED MORRISON IS COMING TO ONTARIO!! Don’t miss this chance to see Fred Morrison in concert on Saturday, February 3, 2018, as he performs in Ontario for the first time ever! Tickets for this great evening of entertainment and the opportunity for winter time socialising with our piping and drumming friends are only $30 each. A bar will be available and a light snack will be served at the intermission. On both February 3 and 4, Fred will also be conducting morning and afternoon workshops (small/reel pipes, tin whistle, highland pipes etc.) for musicians of all ages and abilities. The cost for the opportunity to attend a workshop with Fred is only $30 for each workshop session. Book your workshop and concert tickets by clicking on https://PPDPB.myband.io, then go to the Fred Morrison event page and the pay via PayPal link. We are looking forward to having you join us at this great event!